Revenue in the Large Cars market segment amounts to US$47,891m in 2019. From an international perspective it is shown that most revenue is generated in China (US$75,875m in 2019). The Large Cars Market segment includes family passenger cars of an average footprint around 4.30m2 (46 ft2), an average mass around 1640kg (3620lbs) and a passenger/cargo volume between 3.1 m3 and 3.4 m3 (110 ft3 and 119 ft3). In United States, Large Cars are also known as Mid-size cars as models. The Large Cars Market grew out of the Medium Cars market as manufacturers’ response to consumers’ desire for larger, affordable vehicles around the middle of the twentieth century. This class was a subject to many redefinitions influenced by regulations, making its borders fluent in regard to models size. Example Models: AUDI A4, BMW 3 Series, Citroën C5, Ford Mondeo, Honda Accord, Mazda 6, Mercedes-Benz C-Class, Opel Insignia, Opel Zafira, Peugeot 407, Renault Laguna Hatch, Saap 9-3, Škoda Superb, Subaru Forester, Subaru Outback, Toyota Avensis, Volkswagen Passat. 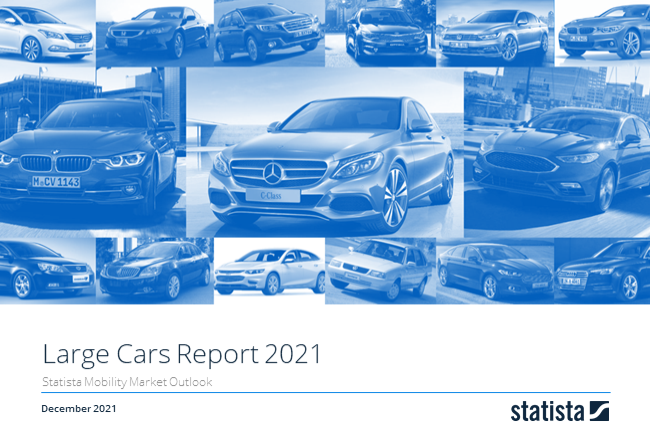 Reading Support Revenue in the Large Cars market segment amounts to US$47,891m in 2019. Reading Support In the market for Large Cars, volume is expected to amount to 1,940.9 t cars by 2022. Reading Support The average price per unit in the market for Large Cars amounts to US$24,147 in 2019. Reading Support With a market volume of US$75,875m in 2019, most revenue is generated in China. Here you can find more studies and statistics about "Large Cars".